Bringing in Bollywood actor Salman Khan to campaign for President Mahinda Rajapaksa is a disgrace to the Sri Lankans, says UNP MP Dr. Harsha de Silva. The president should have asked Sri Lankan artistes like Amaradeva, Malini Fonseka to help him with electioneering without disgracing Sri Lanka as a nation. Khan was accompanied by former Miss Sri Lanka turned Bollywood actress, Jacqueline Fernandez. They are said to be close friends of Hambantota District Parliamentarian Namal Rajapaksa. Meanwhile, Common Candidate’s Media Unit yesterday said that a number of artistes, including Samanali Fonseka and Indrachapa Liyanage had been attacked yesterday in Kurunegala. They were attacked by a mob numbering about 150 when they spoke about the irregularities of the government following a musical show at Kumukgette, Kurunegala. Do you realise that the UNP is a greater disgrace than Salmon? The UNP, being the biggest opposition party for over 15 years, has been unable to put forward a credible opposition Presidential candidate with real socio-economic policies that can be the foundation for an alternative form of government to the Sri Lankan voter? The leadership in your party is a dictatorship run by Colombo based group of high-society manipulators. Just see what happens when you provide opportunity to commoners such as Harin who delivered unbelievable outcomes in the Uva PC elections? 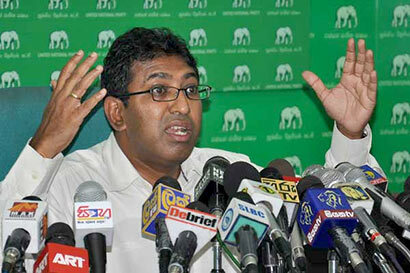 The UNP’s disgaceful leadership is blind to reality. To quote your own word “As a Sri Lankan I am ashamed to see people are being fooled and treated like a bunch of idiots.” Yes Dr de Silva, as a Sri Lankan, I am ashmed to be fooled and treated like like a bunch of idiots by the UNP leadership. Your wimpy leader has settled for the position of Prime Minister under Mr MY3, the bleating goat, as Executive President. If by chance MY3 reaches that chair, he will be dealing directly with Rajitha, CBK, Sampantham, Hakeem, Patali, Mustapha and rest of the handful of cross-over traitors while your boss will be twidling his thumbs in Parliament waiting for that never-coming appointment with MY3.